With the rapid growth of digital consumption, the lines between online and offline shopping experiences have blurred. In order to meet the needs of today’s digital shoppers, retailers must embrace this year’s retail buzzword: omnichannel. Omnichannel focuses on delivering a unified customer experience through all available retail channels including brick-and-mortar stores, online, and mobile. This approach would allow a customer to seamlessly view an item online, purchase it from their phone, and pick it up at the store. In a physical store, retailers are restricted by the amount of square feet they have, thus limiting the amount of inventory they can hold at one time. In an omnichannel world, retailers can merge retail and eCommerce inventories into one, allowing customers to browse and order from all the products available anywhere in the retail ecosystem. A unified inventory allows customers to shop online and pick items up in-store, or vice versa. Additionally, retail employees can assist customers by finding availability and sizes, and placing the order for the customer. Omnichannel aims to provide a seamless customer experience across online and offline channels. Retailers give customers the opportunity to engage with the brand in whichever way they see fit - if a customer wants to browse products on their tablet, order from their desktop, and return an item in-store, they can. This omninchannel approach will rethink the customer experience across channels and devices. In-store digital displays bring the digital experience and full inventory selection to brick-and-mortar stores in an engaging and innovative way. For instance, imagine walking into a Nike store, stepping on a treadmill, and following the touch screen experience, all resulting in the best shoes based on your preferences and foot arch. To top it off, the retail experience could tell you if the shoes were available in-store, or email you your shopping cart so you could complete the order securely from your smartphone. 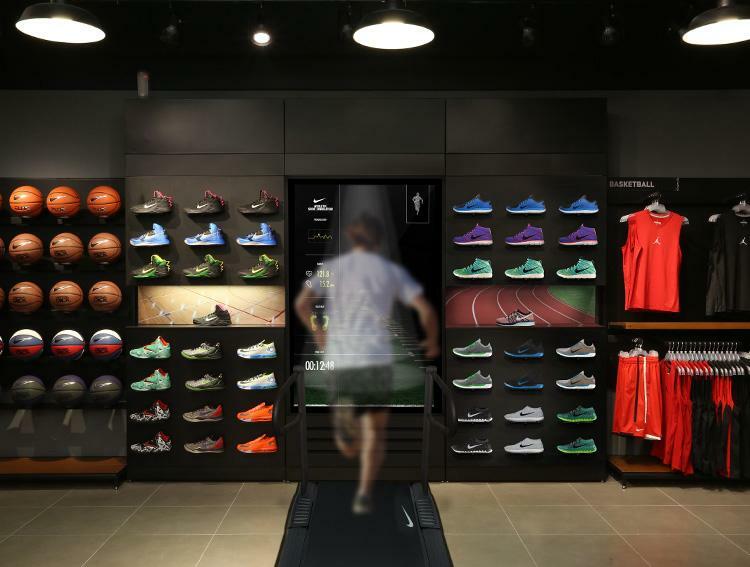 Incorporating the digital retail screens will revolutionize how customers shop, increase foot traffic in physical stores, and drive customers to the brand’s website. Allowing customers to shop in whatever way they want, regardless of their device, creates the importance of having a strong and consistent message across each channel. As they travel from in-store digital screen to mobile to desktop, a unified brand message will enhance the customer interaction across platforms. Implementing omnichannel retailing can create efficiency with operations. Retailers can optimize their order fulfillment processes by shipping from anywhere. A single distribution center could ship to a store or a person, and a store would have the ability to ship to another store or to a person. By shifting the logistics business model, retailers can focus on fulfilling more orders with faster outputs and lower costs. Omnichannel will allow retailers to have a single view of the customer information in one database, including contact details, purchase history, shopping preference, loyalty rewards, and various other data. Retailers can use this information to understand shopping behaviors across all channels to drive their marketing strategies. Retailers who effectively incorporate omnichannel into their business will surpass competition and see a boost in engagement, loyalty and sales by offering customers a personalized purchase journey. Published on September 2, 2014 .